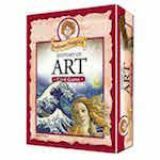 From Leonardo da Vinci to Andy Warhol, the History of Art kids card game explores different topics from people to eras. Though all Professor Noggin's kids card games are written for ages 7 & up, this is definitely a card game that older children and adults will enjoy playing. Professor Noggin's card games are themed with 180 questions based on one subject. With two levels of difficulty, younger children can still play with older siblings or adults and have a lot of fun. Winner of 15 awards! Players: 2 – 8. Ages 7 & up.